Bob-omb Sudden Death is a minigame featured in the Vs. Battle multiplayer mode in New Super Mario Bros.. It is in the 1 on 1 category. The game plays similarly to Sort or 'Splode. The players must drag the Bob-ombs and Bob-omb Buddies that are conveyed into the room to their respective, color-coded sides. Since it is color-coded, a Bob-omb must be placed in the black area, and Bob-omb Buddies the pink. As opposed to two areas like in the single-player game, there are four in this game, two black and two pink. Each one has a number on it: a "5" for the two on top and a "10" for the two on the bottom. 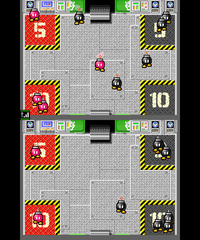 If the number of Bob-ombs printed on the section are placed there, then they are launched over to the opposing player's field. If a Bob-omb or Bob-omb Buddy is placed in the incorrect section, then it, along with all other Bob-ombs on-screen, detonate. Additionally, a Bob-omb that remains on-screen without being placed in a section for so long also explodes. The player that causes either of these to happen loses. "Guide the Bob-ombs to their like-colored carpets. If one gets to the wrong carpet...KA-BOOM!!! Fill carpets with enough Bob-ombs, and they'll march off to your opponent's screen." This page was last edited on May 1, 2017, at 19:29.